(Fu Jianfeng's Blog 傅剑锋) Black Rain (the unedited version). August 24, 2007. At 10:30pm on August 14, a small drizzle began to fall in the Nanshan district of Shenzhen city. A young man who looked as if he had been drenched by black ink stopped in front of a kiosk at the intersection of Qianhai Road and Dongbin Road. The young man purchased three bottles of mineral water from the kiosk boss Xiao Feng and then he began to wash himself from head to feet. The black water came off. Xiao Feng asked him what happened, and the young man pointed angrily at his umbrella. "It must be the poor quality of this umbrella, because the dye came off on my body." Just as he was ready to throw his umbrella away, a girl passing by under the lamp of the kiosk screamed, "Heavens! Good grief! This rain is black!" Xiao Feng and the young man looked under the light and saw that the rain was indeed black. The young man then realized that he had been splashed by the black rain. Three days later, Xiao Feng retold this story to the Southern Weekend reporter (note: this is the blogger Fu Jianfeng) and she was still giggling. The reporter went to the location to verify. The black rain described by Xiaofeng fell in almost all of the neighborhood districts around Qianhai Road and Dongbin road in the Nanshan district -- Birongwan neighborhood, Shanhai Green Mansions, Taizi Villas, Shanshuiqing Gardens, Doingtai Vistas, Nanshan village and Nanshan Industrial Village ... the black rain continued for almost 90 minutes and covered more than 2 square kilometers. The black raindrops on the ground varied from between the size of a needle syringe to the print of the small finger. At Birongwan neighborhood, the largest drops were the size of a one-cent coin. Police officer Feng was patrolling in his motorcycle. When he returned to the office, he found out that he and his motorcycle were both blackened by the rain. The black rain was like ink as well as oil. When he rubbed his eyes with his rain-soaked hands, he felt a burning sensation. His skin also felt slightly painful. Cars parked outside were also 'blackened.' 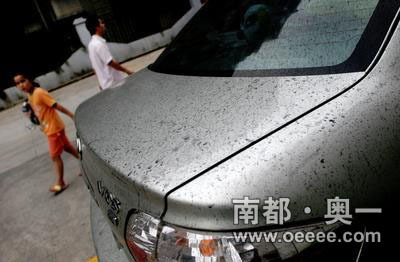 Weng Ninghao's white sedan parked in the open air in Dingtai Vistas became a "speckled dog" under the black rain. "When I took the car to the garage for a wash, the black specks came off but the paint was corroded. This rain is really frightening." Weng Ninghao pointed to the paint chips about the size of sesame seeds on his white sedan. By Weng Ninghao's estimate, there must be at least one thousand cars similarly affected in the surrounding neighborhood. The reporter checked with the local car washes and learned that many of these "speckled dogs" had their paint corroded by the black rain. "When a mid-scale car has to be repainted, the cost might be as much as 10,000 yuan," said the garage owner. 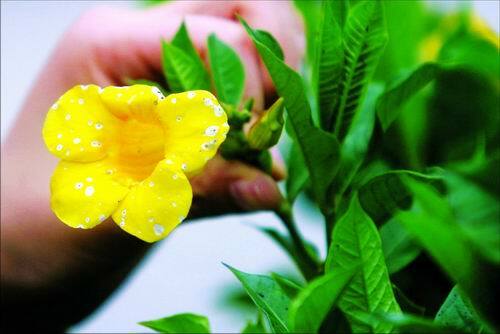 The black rain also affected the plants. According to the media, the acidic black rain burned right through flower petals. When the Southern Weekend reporter came to the neighborhood three days later, he found that there were still scars left on the tree leaves by the black rain. The reporter touched the leaves and his fingers turned black. Although Yueliangwan Villas did not experience any black rain, resident Zhong Jianyu said that many green leaves fell down from the banyan trees. On the morning after Zhong had detected a funny smell in the air. In the area where the black rain fell, the eyewitness kiosk boss Xiao Feng recalled: "When I came back to the kiosk the next morning, the blackened streets seemed to have the smell of dead rats." The Yueliangwan environmental protection liaison team deputy leader Ao Jiannan learned from the Nanshan Environment Monitoring Station that the chemical composition of the black rain was: PH 3.53! According to academic practice, any rain with PH less than 5.6 is classified as acid rain. Ao also learned that the black rain contained a large amount of sulfur material, which was why it corroded car paint, caused a burning sensation on the skin and emitted a pungent odor. The residential areas affected by the black rain were concentrated on the right of Yueliangwan and the northeast of the Nanshan Electricity Plant. Birongwan Neighborhood had the heaviest black rain and it was also the closest to the Nanshan Electricity Plant at only a few hundred meters away. The Yueliangwan environmental protection liaison team deputy leader Ao Jiannan therefore has his speculation: the black rain was due to the Nanshan Electricity Plant burning heavy oil to generate electricity and then releasing the ash residues from the furnace into the air. On that day, Ao had called the engineer Cheng in charge of environmental protection at the Nanshan Electricity Plant. Cheng told him that there was an equipment problem with the number 7 furnace on the previous night. So Ao Jiannan believed that the plant must have released the ash residues during the cleaning process and this was mixed with the rain to form the black rain. With the southwesterly wind, the rain was dispersed in the local residential districts. Engineer Cheng denied the speculation of Ao Jiannan. He said that there was no deliberate emission on that day because all they did was repair the furnace. He believed that it was due to other electricity plants releasing smoke into the air. In this area, there are the coal-burning Mawan Electricity Plant, the oil-burning Yueliangwan Electricity Plant, the garbage-burning electricity plant, and so on. The Shenzhen city environmental protection agency reviewed the emission records at the Nanshan Electricity Plant and the Yueliangwan Electricity Plant. The most recent dates for emission were August 9 and August 13. On the night of the black rain, they did not release smoke. Although there is no direct evidence that the black rain was related to emissions from these two plants, the Shenzhen environmental protection agency told Southern Weekend that, "it is more probable that the smoke pollution on August 14 are related to the industrial emissions from the oil-burning electricity plants in the Nanshan district. Nanshan Electricity Plant chief engineer Cheng Dalei explained the practice of industrial emission at the Nanshan Electricity Plant. When the plant burns either heavy oil or coal, there will be dust affixed to the walls of the furnace. Every two or three days, the plant will have to blow the dust away. In order to reduce pollution, the emissions typically occur at night when the direction of the wind is not towards the residential areas. "As long as you are burning heavy oil at these plants, it is impossible to avoid these types of emissions," said Cheng Dalei. On July 20, for the same "unavoidable reasons," there was a black rain at the Nantou Peninsula. On January 1, 2002, there was a black snow in the same area. On May 13, 2005, a black rain fell in Dapeng Shuitou village in Shenzhen because the Fuhuade Electricity Plant used poor-quality heavy oil to generate electricity. In the same year, the Yuhu Electricity in Longgang (Shenzhen) released emissions improperly and there was a black rain in Pinghu, Longgang. Similar black rains appeared on May 4, 1990 in Xuchi, Yicheng, Qingjiang, Changzhou and other places in Jiangsu province in a belt of rain that stretched 160 kilometers from north to south. In 1994, there were black rain episodes in Chongqing. The water was ink-black in color and highly corrosive. The acidity came from the sulfur mixed in the coal that was being burned. On the morning of June 26, 2005, the Jiulong Electricity Plant in Chongqing city emitted ashes improperly and caused a 90 minute episode of black rain at Huangjueping. On October 19, 2005, the Jialing Electricity Plant emitted a large amount of ashes due to an accident, and this caused black rain to fall on the east side of Chengdu city. Following this latest episode of black rain, the Shenzhen city environmental protection agency has imposed an even stricter inspection schedule on the electricity plants. Each time that they emit, they have to notify the environmental protection agency six hours ahead of time. The agency will then send its inspectors to watch closely and supervise. In the view of chief engineering Cheng Dalei, the only way to solve the pollution problem is to change the fuel from heavy oil to natural gas (LNG) so that there is zero emission of sulfur dioxide and ashes. Nanshan Electricity Plant undertook the project to go convert from oil to gas this year. At the end of the year, the four equipment units will be ready. The Shenzhen city environment protection agency has assessed the impact and found that each unit will reduce ash emission by 168 tons, nitrous oxygen by 2,088 tons and sulfur dioxide by 1,218 tons per year. The Nanshan Electricity Plant accounts for 1/3 of the local electricity generation as well as 1/3 of the local sulfur dioxide pollution. If the units are successful at reducing emission, it will directly improve air quality. But international price for natural gas has been high this year, and the Dapeng Natural Gas Company can only supply Nanshan Electricity Plant with enough fuel for only one unit. The other three units will have to continue to burn heavy oil. This created a dilemma for Cheng Dalei. On one hand, Shenzhen is severely low on electricity supply, and there is tremendous pressure on the plants to generate more electricity. "If a unit is one hour behind in generating electricity, we must notify the Ministry of Trade and Industry." On the other hand, the city government is not providing enough natural gas and therefore the plants have to burn large amounts of heavy oil to accomplish the mission. This results in more pollution, and then the environmental protection agency and the local residents complain. This particular black rain episode was the culmination of the dilemma. Wei Yongquan claims to the most direct victim in the area. Wei Yongquan's apartment is number 9B at the 25th building of the Shanhai Green Mansions estates. From his verandah, we can see the seven smoke stacks of the Nanshan Electricity Plant just two to three hundred meters away. Although the wind is blowing away from the apartment, the reporter can still detect the unpleasant odor of sulfur dioxide. On the night of the black rain, the wind was blowing towards the master bedroom. "The black rain came through the window screen with the wind and fell on the window sill." "The torment from black rain is temporary, but the torment from the sulfur dioxide of the electricity plant is permanent. I have been awakened many times by it!" Wei Yongquan said that when the north wind blows in winter, the sulfur dioxide from the Nanshan Electricity Plant is blown directly into his room. It is useless even if he shuts the windows. He coughs periodically because he says that his respiratory tract is faulty from the air pollution. He was healthy before he moved into the Shanhai Green Mansions. According to investigation, there are many senior citizens and young children with respiratory problems in that neighborhood. Even young people have problems. A young man named Wu was healthy when he moved here three years ago, but he has coughs and colds now. Thirty-nine families have indicated that they have health problems and they are asking the environmental protection agency to "remove this poisonous tumor." Their worries are not unfounded. In the Harbor Bay area not far away from the black rain area, statistics showed that there were 22 cancer patients out of a population of over 2,000, and this is far higher than the normal rate. Shenzhen city people's congress representatives Zhang Zhifeng and Huang Xianda made a proposal in 2004 in which pointed out that environmental pollution has been affecting the lives and health of the people of Nanshan, with the incidences of colon cancer, respiratory diseases, allergies, sleeplessness, dizziness, memory losses and other symptoms rising; leukemia, liver cancer, stomach cancer and other malignant cancer are also on the increase. The proposal claimed that Nanshan is the most polluted area in the whole city, with the people of Nanshan spending two-thirds of their time in low- and middle-levels of pollution. The principal atmospheric pollutants are carbon dioxide, nitrous oxide, ashes and exhaust gas. There are historical causes for pollution in the Nanshan area. The Nantou Peninsula was designated as an industry zone in the early years and there are many industrial and electric enterprises, such as the Nanshan Electricity Plant, the Yueliangwan Electricity Plant, the Mawan Electricity Plant, the Garbage Electricity Plant, the Guangxi Electricity Plant as well as various dyeing plants, wood material plants and piers with a great deal of ship and vehicular traffic. According to Shenzhen city environmental protection agency deputy director Chen Weiyuan, "The electricity plants are the principal polluters in Shenzhen. They account for 91% of the city total. In the Nanshan district where the electricity plants are concentrated, they have 77% of the pollution in Shenzhen city." At the end of 2005, the Shenzhen city government came up with a combined plan to deal with atmospheric pollution at the Nantou Peninsula. In 2006, the 6 equipment units at the Mawan Electricity Plant were equipped to eliminate sulfur, thus reducing sulfur dioxide release by 40,000 tons. Before the two Congresses were held in Shenzhen, Shenzhen city mayor Xu Zhongheng received the proposal to clean up pollution at the Yueliangwan district. Two months later, the project to convert from gas to natural gas began at the electricity plants. "Mayor Xu's pragmatism brought us hope. But the change has not occurred fully and the sulfur dioxide continues to be blown inside my home," Wei Yongquan said with some impatience and anxiety. Wei Yongquan has made more than one hundred complaints calls to the environmental protection agency. Many other local residents have been bothered by the environmental pollution as well. The Nanshan Electricity Plant which has been the target of the black rain as well as other regular complaints feels hapless. Chief engineer Cheng Dalei said: "The residential districts are too close to us. Even if our emissions adhere to the standards, it will still affect the living conditions of the residents. We will continue to get complaints against us." From the verandah of Wei Yongquan, it can be seen that Phase II of Shanhai Green Mansions and Phase II of Birongwan are under construction and they are even closer to the Nanshan Electricity Plant than the completed Phase I buildings. The new ones will be at most several hundred meters away from the plant. Even close to the plant is Phase II of the Fanhai Estates, also under construction. "This black rain episode alerts the public that the pollution from the electricity plants cannot be solved in the short term due to many objective conditions. The government knows that as well. So why do they continue to allocate land next to the electricity plants to residential real estate developments?" According to information, these plots belonged to the Nanyou Group and the Ministry of Trade Development before 1998. These two groups are enterprises which also have administrative power. Following the sharp rise of housing prices, the two groups used their administrative power to sell some of the land around the electricity plants to real estate developments. This was how the apartment buildings came to be built near the electricity plants. After 1998, the Shenzhen city government took back the administrative power but the former projects were not terminated. In 2004, a city people's congress delegate exposed the flaws with a proposal: the reason why the environmental problems in the Nanshan district continue to get worse was because the urban functionality planning was in conflict with the urban development strategies. In the early history of the development of the Nanshan district, Nantou was planned as a "pollution zone." Many polluting types of industries and the large-scale electricity plants were located in Nanshan. In the 1990's, large-scale residential construction began in the Nanshan area with commercial-class residential buildings in the "pollution zone." This year, the housing price in the Nanshan district has risen to 20,000 yuan per square meter. Some individual apartments were going for as much as 50,000 yuan per square meter. These quick profits cause the real estate developers to ignore the dangers of pollution near the residential buildings. The Shenzhen city environmental protection agency deputy director Chen Weiyuan said: There must a proposal to limit real estate development in the Nantou Peninsula; until the quality of air improves significantly, there should be no more residential construction projects in the district. The currently constructed Shanhai Green Mansions Phase II is only several hundred meters away from the Nanshan Electricity Plant but it has gotten approval papers from the environmental protection agency and the planning agency. Adjacent to the Shanhai Green Mansions Phase II is the Birongwan Phase II. The Shenzhen urban planning department has not issued a <Construction project permit> but the developers went ahead by themselves. "When the owners move into these new apartments, we won't even have to worry about the black rain. Just the presence of the smoke stacks will brings us a new round of conflicts," sighed Zheng Dalei. If one walks from the Nanshan Electricity Plant and crosses the Yueliangwang Avenue, one reaches the Shenzhen University Middle School with a few steps. More than two thousand students are boarders there. "When the national flag is raised in the morning, the students can also see the heavy smoke coming out the smoke stacks of the Electricity Plant," said Yueliangwan district environment clean-up liaison team deputy leader Ao Jiannan. The black rain this time fell on the Shenzhen University Middle School as well. Ao Jiannan is even more concerned about the huge fuel tank right next to the Nanshan Electricity Plant. This tank stores 700,000 tons of fuel per year. The tank is only separated from the Shenzhen University Middle School by a road. "This is a time bomb!" said Ao Jiannan. On August 5, 1993, there was a fire at a storage warehouse for hazardous materials, which is next to the Qingshuihe fuel storage tank. The resulting explosions caused 15 deaths, more than 800 persons injured and 39,000 square meters of buildings were destroyed. "We must not fail to learn this lesson," Ao emphasized. But the Shenzhen city urban planning department and the municipal affairs department told Southern Weekend that there is no possibility of relocating these electricity plants for now. "There is too little land in Shenzhen. Urbanization is occurring too quickly, so that there are no fringe areas keft. It would be wrong to move the plants anywhere." Besides, as urbanization and industrialization continues, it is not possible to reduce the supply of electricity. In fact, they will need new electricity plants. Ao Jiannan suggested: "Since it is not possible to reverse the addition of more residential areas in the district, what the government can do is to guarantee absolute production safety at the electricity plants, to guarantee that the plants will get enough liquid gas and to guarantee that the environment of the students and the residents will not be polluted. This should be treated as a political mission to be accomplished. Otherwise, when something goes wrong, it may be a disaster far worse than the black rain episode."